The long serving Uganda government has finally repossessed Uganda Railways after Rift Valley Railways (RVR) ran it down for 12 years. The 120-year-old railway line was concessioned out in 2006 to what the revolutionary NRM government told us was a rich and experienced South African government railway company. But like the case has been with many transactions under this government, the investors procured for the railway business were just a bunch of fortune-hunters who simply sniffed at an opportunity. In the concession, Rift Valley Railways was supposed to rehabilitate wagons, procure new locomotives and rehabilitate existing ones. It was also supposed to repair the track between Jinja and Kampala. It was supposed to increase freight volumes up to 217.3 million tonnes as a baseline and to reach a level of 275 million tonnes within a period of two years after the signing of the concession (2006). 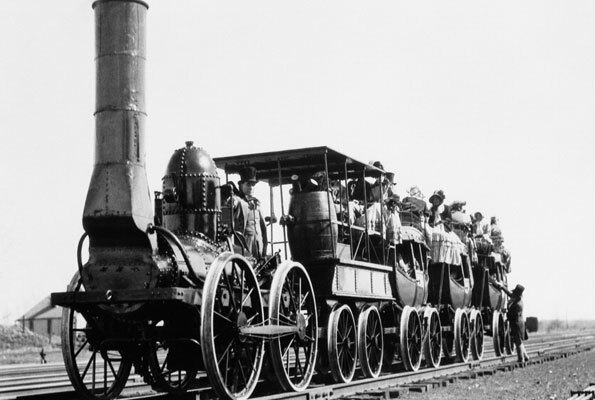 As a country, we were also entitled to 11.1 per cent of revenue of the railway business. How this figure was worked out, I don’t know! I had an opportunity to chair the parliamentary committee on Commissions, Statutory Authorities and State Enterprises (Cosase) for two and a half years (from December 2014 to May 2016) and Uganda Railways Corporation (URC) was one of the companies that appeared before us. The managers of URC, which was supposed to oversee the concession, told us (Cosase) that RVR breached the terms of agreement right from the start and was incapable of managing a business of this magnitude. The country must know that two things happened immediately after RVR took over our railways. The investors took away all the brand new vehicles (4WD) to Kenya, where they had also entered into a concession to manage Kenya Railways. As the investors were feasting on new vehicles and other assets, the revolutionary government was feasting on prime land. Most of Uganda Railways land was categorized as non-core assets and, therefore, not handed over to RVR. The scavengers in government descended on it and by the time sale of Uganda Railways land was halted, the corporation had been stripped of all its residential houses in Kololo near the airstrip, in Nsambya and Kabuusu on Masaka road. And this has happened to all corporations. Land belonging to Uganda Broadcasting Corporation (UBC) in Kololo, Bugolobi and in Industrial Area was robbed in broad daylight by the revolutionaries or their agents. Remember what happened to National Social Security Fund (NSSF) houses in Muyenga and elsewhere? What about the cotton houses in Nakasero? Most of the buildings in Nakasero, Kololo, Bugolobi and part of Kamwokya belonged to the public. I fear to use the word government because Mr Museveni thinks government is his private company. These fellows have looted this country! Therefore, what was supposed to be sold in the second phase was railway land in Jinja, Tororo, Gulu and Masindi. Phase one was for Kampala. This is the condition under which Uganda Railways is being repossessed. And you didn’t have to be an engineer to know that RVR was a circus. First, even as a parliamentary committee chairman, I failed to know who these RVR fellows were. In truth, they were not the South African government company that we had been promised. Maybe one of the original concession owners was a South African and, I think, another a British. Something like that! After failing to reap big in the railway business, the concessionaires, I am told, wanted to sell the line to the Chinese before running away. That is how they rushed to evict poor people who had settled around the non-functional rail line. 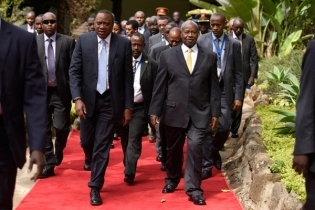 The intention was to sell the line to Chinese companies that want to construct the standard gauge railway. This didn’t work out, hence halting the eviction. That was the last business opportunity that RVR wanted to exploit before running away with their bounty. If you want to know how poor and unprepared RVR was, even the $64 million they wanted to use to revitalize the business was borrowed from International Finance Corporation (World Bank) and German Development Bank (KfW). These fellows came in without money or, if they had, they never wanted to invest it. And I think that is what the Umeme concession is all about. The investors came in with very little and are collecting billions which they repatriate and just reinvest a small portion of it. It is the reason parliament recommended termination of this concession as well. One of our biggest problems in the electricity sector today is generation of excess power. We are generating about 685MW and consuming 550MW, according to Electricity Regulatory Authority (ERA). And to pay off the excess power generated, we are spending Shs 68 billion on thermo generators and about Shs 11.57 billion on what is called deemed energy purchases. The concessionaire (Umeme) has no obligation to expand the transmission lines. That is why only about 20 per cent of Ugandans are using electricity, which explains the excess. We should never have sold this business because it is capable of growing by itself if only managed properly by nationals (patriots). That is where we are. Wait when these agreements with Chinese companies begin to run. Hundreds of workers of street-parking firm, Multiplex-Uganda are on a sit-down strike protesting against poor pay and working conditions. The striking workers have gathered at the Railway Grounds in central Kampala leaving street parking in the central business district unattended to. They laid down their tools today over a litany of demands which they want to be fulfilled. The workers say they receive a net pay of Shs 6,500 a day, an amount too small to live on in Kampala. They also accuse their employer of not remitting contributions to the National Social Security Fund (NSSF) despite making deductions from their meagre pay. The workers add that although they are entitled to an additional Shs 2,000 per day to cover the cost of their meals, the money is delayed and quite often paid in arrears. They also want the rate increased stating that Shs 2000 is not enough to cover the cost of food anywhere in the central business district. The workers also complain that they are not entitled to medical care yet the conditions under which they operate, including in rainy, sunny, and dusty conditions make them susceptible to various health complications. They say when one falls ill, on or off the job, he or she struggles single-handedly without any support or empathy from the Multiplex management, adding that such a person also doesn't get paid his or her wages. The Multiplex workers say they are denied personal protective gear like overalls, nose covers and caps, exposing them to vagaries of weather. According to the workers, some of their supervisors subject them to physical, sexual and emotional abuses. They add that they are body checked in such a way that portrays them as 'thieves' of company money, demeaning them and lowering their self-esteem. 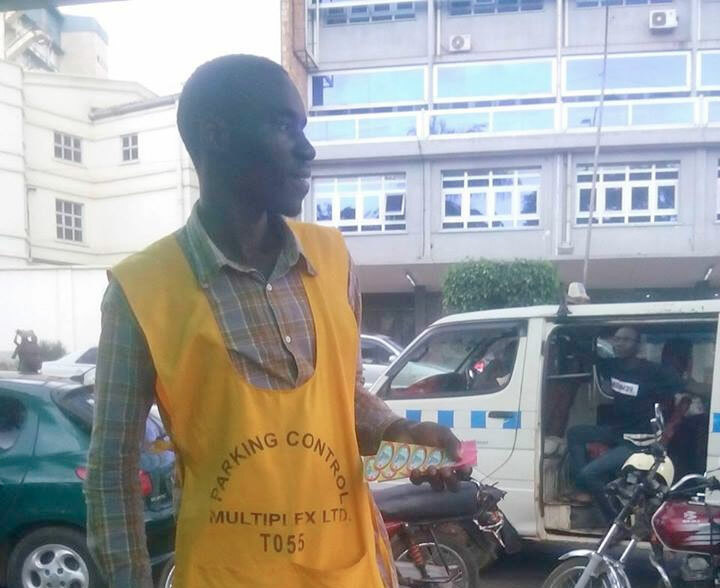 They reason that while parking fees have increased from Shs 400 to Shs 1,000 per hour and monthly stickers from Shs 42,000 to Shs 105,000, that has not been reflected in their pay and working conditions. They now want management to improve their pay taking into account the high cost of living in the city. Sources said the workers held a general meeting on Sunday over the industrial action. That while a few workers opposed going on strike, the majority were in favour. A receptionist at Multiplex said the managers were locked up in a crisis meeting. Marked in brown are the roads Uganda wants the Chinese communists to build so that the French capitalists can come over and take the oil from Uganda. 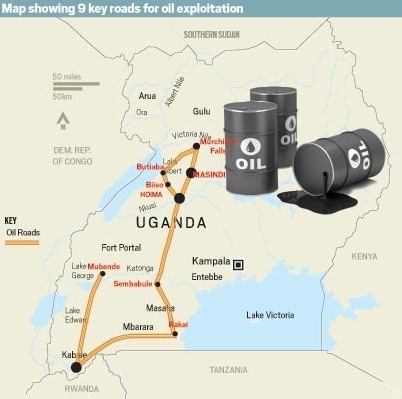 UGANDA, Kampala: The government has turned to China’s Export–Import (EXIM) Bank to secure funding for the construction of ten “critical oil roads” in the oil belt, Albertine Graben, in South Western Uganda needed urgently to ease the ongoing process of expediting commercial oil production to start by 2020. Uganda and Kenya governments and the Communist China are in limbo about releasing more money for building a modern railway for these unstable third world economic countries. Uganda’s Finance minister Matia Kasaija and his Kenyan counterpart are yet to get confirmation of the specific dates for further negotiations and possible financial closure from China’s ministry of Commerce which supervises EXIM Bank, the prospective financier of the Standard Gauge Railway (SGR), Daily Monitor has learnt. Technocrats from ministries of Finance and Works as well as the SGR project led by Mr Kasaija had been scheduled to travel earlier-on for the meeting on February 27 (yesterday), but the arrangement suffered setbacks. The Ugandan team was supposed to travel with the Kenyan delegation to Beijing, China. 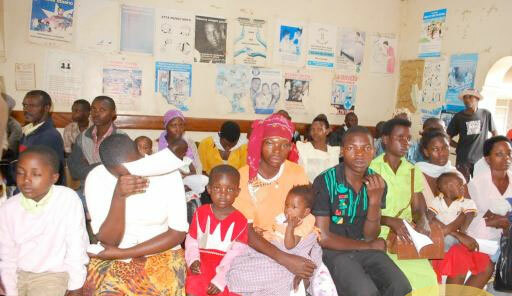 Mr Kasaija, yesterday, said they will travel any time but confirmed that they are yet to get the requisite clearances. The meeting is expected to reach a final understanding regarding the financing of the multi-billion dollar railway from Nairobi to Malaba on the Kenya side, and Malaba to Kampala on the Uganda side. The stretch from Mombasa to Nairobi is complete and is expected to be commissioned this June. If the discussions are fruitful, Uganda expects an advance of $2.8b (Shs8 trillion) or 85 per cent financing for construction of the Malaba-Kampala stretch (273km). Each kilometre will cost $8.4m (approximately Shs30b). The plan is that after the Malaba-Kampala stretch (the eastern route), Uganda will embark on the western route from Kampala to Ntungamo near the border with Rwanda and then northern route from Tororo to Packwach near the South Sudan border. The entire SGR project in Uganda is expected to cost $12.8b (Shs46 trillion), making it the most expensive infrastructure project in Uganda’s history. On the Kenyan side, the line (120km) running from Nairobi to Naivasha is expected to cost$1.7b (Shs6 trillion), the line (266km) from Naivasha to Kisumu port cost $3.6b (Shs13t) while the 107km line connecting to Malaba will cost $1.7b (Shs6t). Beijing, which has for months been very guarded on financing the railway from Nairobi to Kampala and has been shuttling back-and-forth with economic calculations, to eventually release the money boxed officials from Uganda and Kenya into a tight corner to agree, guarantee and ensure timely construction of the connecting routes for the railway to run seamlessly up to Kampala for it to make sense. Wrong location. Uganda National Roads Authority (UNRA) is set to start demolishing structures such as this building in Bukoto, Kyebando, a city suburb, that encroach on the road reserve. The government will soon start demolishing structures, including markets and institutional buildings, erected within gazatted road reserves along national roads. Billed as an operation to de-congest the city, Uganda National Roads Authority (Unra) said a deadline it issued to encroachers to leave voluntarily expires today and will not be extended. “We anticipate that this exercise will help decongest the roads and reduce the heavy traffic pains that the users of roads have encountered,” Unra executive director Allen Kagina said in a statement yesterday. The Roads Authority has reportedly briefed President Museveni and police, respectively, about the upcoming exercise in order to stave off a possible political backlash and guarantee the execution is incident-free. Mr Frank Mwesigwa, the Kampala Metropolitan Police commander, confirmed that they had been notified and said they are awaiting a required detailed report about the demolition plan to guide police deployment. According to Unra’s statement, the exercise will start from Kibuye round-about on the Kampala-Entebbe highway and progress toward Entebbe town. Structures on road reserves are illegal and the encroachers will not be compensated, officials said. A road reserve, according to the colonial-era Road Act 1949, is an “area bounded by imaginary lines parallel to and distant not more than 50 feet (about 16 metres) from the centre line of any road”. Section 5 of the said Act mandates the Roads Authority to “remove interferences” such as unauthorised building, plants/crops, access lanes, cattle paths and bicycle tracks from the roads which technically includes the carriageway, separators (island), shoulders, drainage channels, side-walks and road reserves. “This is, therefore, to advise all individuals who have structures or unauthorised activities of any form in the road reserves anywhere along the national roads to vacate before demolitions and forceful evictions commence,” Ms Kagina noted in yesterday’s statement. If any encroacher defies official orders to pull down illegal structures erected on road reserves, the Roads Authority can raze it or the encroacher, upon conviction by court, is liable to a fine not exceeding Shs1,000. Road reserves, among other things, are used for piping or conveying utilities, expanding the carriageway or planting trees to beautify the road. Unra says it has, through random inspections, established that many individuals have encroached on the national road reserves in contravention of the law. “In some instances the encroachment has been extended to the walkways, road shoulders and the road carriageway itself thereby posing danger to roads users especially, pedestrians,” Ms Kagina noted. The reaction by affected property owners has varied from compliance to consternation, anxiety and, in some cases, outright anger and protest. This newspaper understands that up to 55 structures will be pulled down between Kibuye Round-about and Najjanankumbi on Entebbe highway based on an ongoing inventory of affected properties. The next phase of the registration of such illegal developments will cover Kajjansi Trading Centre, where the under-construction Entebbe expressway intersects with the current Entebbe highway, and proceed to the airport. After the demolitions on Kampala-Entebbe highway, Unra plans to shift the phased exercise on outbound city routes to Jinja, Masaka, Mityana, Hoima and Bombo. Unra’s head of corporate affairs Mark Ssali said besides the two weeks’ notice served to all encroachers on January 31, 2017, “our directorate of road infrastructure has been on the roads for the past one year engaging and sensitising people”. “So, we think we have reached out enough and given everyone time,” he said. This newspaper understands that up to 55 structures will be pulled down between Kibuye round-about and Najjanankumbi on Entebbe road based on an ongoing inventory of affected properties. The next phase of the registration of such illegal developments will cover Kajjansi Trading Centre, where the under-construction Entebbe-Kampala Expressway intersects with the current Entebbe road. Interesting indeed that many of these structures in the one single international city of Uganda belong to influential individuals in this government of 30 years rule. 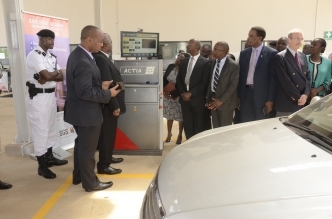 The Official Opening of the single Kawanda Motor Vehicle Inspection Station nation-wide. Four concerned citizens have petitioned the High Court in Kampala seeking orders to have Works and Transport Minister Eng. Monica Azuba Ntege prosecuted over planned nationwide mandatory motor -vehicle inspection. The citizens led by Aaron Izimba also want orders permanently blocking the vehicle inspection, and the immediate cancellation of a contract signed on behalf of government between the Works and Transport Ministry and Switzerland-based Societe Generale De Surveillance (SGS) in September this year. Izimba and colleagues contend that the government already has a motor vehicle inspection project run by the Uganda Police Inspector of Vehicles at Naguru, Jinja, Mbarara and Mbale, under the Traffic and Road Safety Act. In their petition, they said the deal with SGS is a deliberate move “to rob Ugandans of over 200 billion shillings paid for several inspection services to enrich an individual company”. The plaintiffs have also sued the Uganda Revenue Authority (URA) for “neglecting its mandatory duty to collect taxes on behalf of the public, and instead let its powers of collecting such exorbitant fees be usurped by a private company”. The one garage available nationwide to inspect over 10 million vehicles every week, every month and every year as the large volume of traffic moves around the country awaiting inspections! They want court to declare the inspection project illegal and instead order the Works and Transport Ministry to take measures to mitigate major causes of road accidents, such as drunkenness, untrained drivers and marking of black spots. 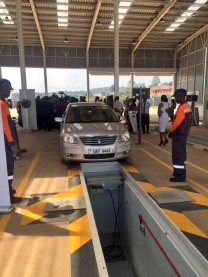 The mandatory annual vehicle inspection exercise was rolled out by Uganda Bureau of Standards in September this year and is aimed at taking off the road vehicles in dangerous mechanical condition, to reduce road accidents. Inspection fees will be paid and defaulters will be made to pay hefty fines. It is clear that this government has been collecting hig-tech revenue big time without consolidating any investments into the development of modern public transportation systems. Motorcycle taxi operators wait for customers at Luanda market, Vihiga County in western Kenya. The explosion of motorcycles in Africa is projected to escalate to new levels as two-wheelers become the main means of transport for the majority of the continent’s population. The explosion of motorcycles in Africa is projected to escalate to new levels as two-wheelers become the main means of transport for the majority of the continent’s population. A new report by US-based consultancy firm TechSci Research shows that motorcycle manufacturers and assemblers are seeking to increase their presence on the continent, where the business is projected to more than double from $4 billion to $9 billion over the next five years. The report shows that South Africa, Nigeria and Tanzania are the largest motorcycle markets, followed by Kenya, Algeria, Uganda, Egypt, Morocco, Angola and Ethiopia. “The public transport systems in African countries are still inadequate and poorly developed, and consequently, two-wheelers are becoming a key mode of transport in urban and rural areas,” says the report titled Africa Two-Wheeler Market 2011-2021. In East Africa, the significant growth of the motorcycle sector has largely been driven by attractive fiscal incentives that have resulted in a drastic decline in the prices of the two-wheelers. Kenya’s decision to waive import tax and the completely knocked down (CKD) parts tax in 2007 saw a huge increase in motorcycles — popularly known as boda bodas — in the country. Recently, the government abolished excise duty on locally assembled motorcycles, a move that is intended to spur further growth of the sector. In 2007, Kenya had fewer than 100,000 registered motorcycles — today the number stands at over 700,000. There are also now 21 assemblers, yet five years ago there were no assembling operations in the country. Tanzania is the biggest motorcycle market in the region and has about one million registered boda bodas. Uganda has about 200,000. 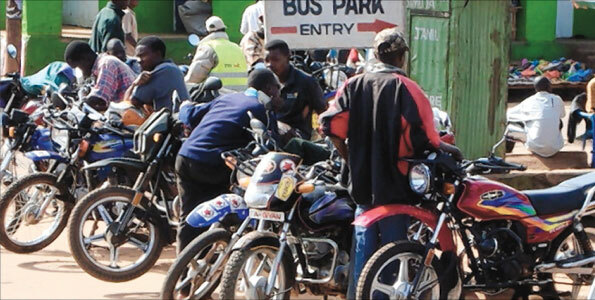 However, as the industry grows, there are concerns about boda bodas becoming a menace. In Kenya, security and health stakeholders have questioned the government’s decision to abolish excise duty on locally assembled motorcycles. According to Daniel Lemmer, chief operating officer at Securex Agencies Ltd, crime involving armed gangs on motorcycles is on the rise. In the past three months alone, boda boda crimes accounted for 13 per cent of all armed robbery and theft incidents recorded by the company. Apart from insecurity, boda bodas are also choking health sector budgets, with statistics showing that motorcycles accounted for about 20 per cent of fatal accidents in Kenya. In Tanzania, motorcycle riders account for 22 per cent of road accident deaths and 25 per cent of injuries. Despite the growing concerns, industry players say the projected boom in the motorcycle sector is good news for Africa not only providing affordable transport but also leading to job creation and economic development. “Those saying that we need to slow down the growth of the industry are not looking at the bigger picture, particularly in job creation,” said Isaac Kalua, chairman of the Motorcycle Assemblers Association of Kenya. He said the 21 motorcycle assembly plants release at least 100,000 motorcycles into the Kenyan market every year, creating 500,000 direct jobs and supporting a further four million Kenyans indirectly. Besides generating $3.8 million in income daily, the industry has contributed over $21.3 million to exchequer. Currently, three top manufacturers control over 60 per cent of the regional market. Indian company Bajaj Auto Ltd, which manufactures the Boxer brand, commands the biggest market share, followed by Car & General with its TVS brand and the Honda Motor Company with its Honda brand. Assembling motorcycles in the region has been instrumental in driving the growth of the market because it has drastically reduced the cost, which currently stands at an average $850 for a standard motorcycle. According to the TechSci Research report, lack of reliable public transport systems and increasing urbanisation means that the growth of the motorcycle industry is inevitable. The reports adds that worsening traffic gridlocks and rising fuel prices are also driving demand for two-wheelers in the continent. “With more than 45 per cent of Africa’s population living in urban areas, demand for two-wheelers is predicted to grow over the next five years,” said the report. According to the World Bank, Africa’s population is predicted to reach 2.8 billion by 2060, something that will exert more pressure on governments to develop and strengthen transport networks. It is for this reason that leading global two-wheeler manufacturers from China, Japan and India are seeking to increase their presence on the continent. China remains the world’s leading motorcycle exporter, controlling 29 per cent of the total global market and raking in $6.1 billion. Japan follows with an 11.6 per cent market share worth $2.4 billion. India is third with an 8.5 per cent market share worth $1.8 billion. One would want to ask how much money exactly has been invested in modern international public transport systems on the continent of Africa for the last 30 years? There was the ambition once of bulding transnational motorways alongside with highspeed trains on this continent Northbound and Southbound from Egypt to Southern Africa and Eastbound and Westbound from Kenya to Kinshasa and Brazzaville(Pointe-Noire) in the Congo. 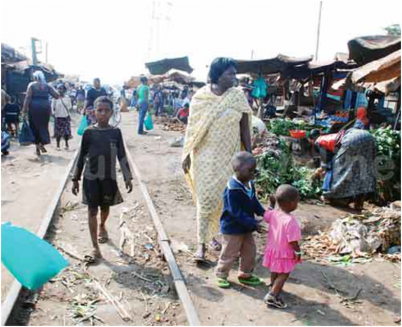 Uganda National Roads Authority (UNRA) is seeking the relocation of market vendors from roads within the urban centres. Some of the markets that UNRA wants removed from the roadsides include those in Kalerwe, Kireka and Busega in Kampala, and Abayita-Ababiri on Entebbe road in Wakiso district. 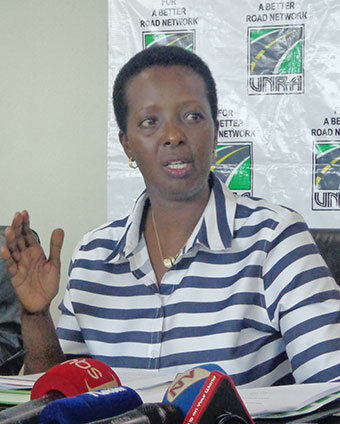 UNRA executive director Allen Kagina, says that a number of markets keep springing up on every road that is constructed posing a lot of danger to road users. Kagina was speaking at a consultative conference with Members of Parliament at the Kampala Serena Hotel yesterday. "When we construct roads, it changes people's livelihood, one of the things that has happened especially around the roads radiating out of Kampala and major towns closer to Kampala, people very quickly build markets," Kagina said. Kagina attributed road accidents on the Northern-bypass and Kireka-Banda area along Jinja road on the vendors who jam the roads and people end up being knocked especially in the night. "I think the Northern-bypass has three markets in the day and around four markets at night and these completely block the road. So what was supposed to be a quick route around town has been a major hindrance, in fact it is faster to go through town than to use the Northern-bypass", Kagina said. Kagina also explained that it takes a person three hours at Abayita-Ababiri when they are leaving or going to Entebbe because of a roadside market that ‘narrows’ the road - causing unnecessary traffic jam. She said that officials from UNRA will soon be going on a campaign to sensitise the public not to build markets in road reserves. 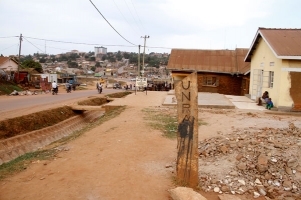 Kagina said that on average, every week two people are knocked dead around the Kireka market . “We have seen on the Northern-bypass the growth of the markets and they start at about 5.30 to 6pm and then by 9-10pm it is full blown. They are using tadooba [paraffin candles] and you can’t see. Children are crossing the road, women are carrying things on their heads and vehicles just ram into them. There are many deaths on the Northern-bypass, Kalerwe, Abayita-Abibiri, when you are leaving the airport or your moving towards the airport and you can get stuck there not because the road is narrow but because it is being jammed by people who are selling and buying. And because they are selling and buying, it means those who have come to buy, come in the taxi and stop at that very spot. Sometimes you find 5-6 taxis adjacent to the market”, she said. "Everybody has a lead car, sometimes lead cars are in a jam themselves, one lead car has jammed another and another, it just doesn't make sense anymore," Kagina said. “We have not done this [study] but I think it is something we should take up and actually analyse the cost of that [traffic jam] to the economy. If you’re coming to work in the morning and you’re stuck at a market for 3 hours, what does that translate into as far as productivity is concerned? Pollution is another very dangerous case to consider. Because, if you’re supposed to be on the job [for] 8 hours and you can only be there for four hours that means you have cost the economy that amount of hours and yet you are going to be compensated for it in your salary. So, that is a study we must do see what traffic jams are costing us”, she added. She said that UNRA has information that Uganda has lost tourists to Kenya and Rwanda because of heavy traffic on Entebbe-Kampala road. “Those markets have brought us enormous problems. It is very hard to control people in markets. Everyone has their motives and destination so you can’t channel them and direct them where they should pass because it is a market. The problem comes when they put a market on a road with heavy traffic; they cause traffic jam as well as increasing accidents. Northern-bypass, Kalerwe, Nansana, Busega all has markets that shouldn’t be there because they are on the road. The main purpose for the construction of the Northern bypass was to ease traffic out of the city. But now the bypass doesn’t serve that purpose anymore because markets are blocking traffic. We are in the process of expanding the Northern bypass to make it a dual carriage way but even if we do that, it will have no meaning for as long the markets are still on roads.”, she added. Used car dealers in dilemma. The importation of used vehicles in the country has dropped by more than half due to a raise in environmental tax. INDEPENDENT JIMMY SIYAMalik Azhar, the managing director of Al Malik Group, one of the leading importers of used motor vehicles in the country, now spends a lot more time negotiating with prospective car buyers. The prices are simply unbelievably high compared to only a few months ago. “Right now, business is tough. You have to spend a lot of time negotiating with the customers; they want vehicles but the increase in taxes have pushed their prices upwards,” Azhar, also the chairperson of the Used Car Dealers Association, says. Clad in a white stripped T-shirt and a khaki trouser, the soft spoken Azhar says since the raise in environmental tax on used vehicles three months ago, average sales for each of their members have dropped from 15-20 motor vehicles per month between July and Sep. 2014 to 2-3 vehicles during the same period this year. And with the weakening shilling, their prices are likely to remain high, at least for some time. On June 11, the government announced a temporary raise in environmental tax on used motor vehicles from 20 % to 35 % for vehicle imports of 5-10 years old and to 50 % for those above ten years. Goods vehicles, however, were excluded from the increase in tax. The change in taxation policy on vehicles to a regime based on age was meant to reduce carbon emissions, which is said to be higher in older vehicles. The new rates were based on the premise that older cars carry a higher depreciation rate than newer vehicles. The policy thus is meant to encourage importation of newer models, which would be less detrimental to the environment. Over the years, used vehicles have been popular with the majority of Ugandans who cannot afford brand new machines. But the trend, according to the dealers and the Uganda Revenue Authority (URA), is taking the opposite direction as the environmental tax and the weakening shilling pushes their prices upwards by nearly 50%. Data from the URA shows that used vehicle imports in the past three months have sharply dropped by more than half compared with the same period last year prior to the imposition of environmental tax. The environmental tax came into force on July 1. The used vehicle imports dropped from 8,630 vehicles between July and Sept. 2014 to 3,956 during the same period this year, representing a 56 % drop as the tax took toll. Uganda is not the only African country that has increased taxes on used vehicles. In Kenya, importers of used vehicles have to pay Shs 5.2 million for vehicles aged over three years old and Shs 3.5 million for those less than three years old, in addition to the mandatory taxes. Malawi introduced an additional excise duty of 35 % tax on vehicles between eight and 12 years old and 50% for the vehicles above 12 years old levied on the sum of the cost, insurance and freight, value added tax and import duty. The revised taxation system, introduced in 2010, applied excise duty to used vehicles that rises in line with the age of the vehicle leading to a decrease in the number of older and more polluting vehicles on the road. Apart from deterrent taxes, other African countries have set an age limit for used vehicles that may be imported. Algeria, Senegal, and Guinea allow importation of old vehicles of up to five years whereas Nigeria has an age limit of 10-15 years. South Africa, on the other does not allow the importation of used vehicles at all. But luckily for the South Africans, the conditions are conducive to helping people acquire brand new vehicles through hire purchase and bank loans, which are cheaper and easily accessible on good terms. At Toyota Uganda, a new RAV 4 costs $47,000 (about Shs 160m), while the SUVs cost as much as $147,000 (Shs 500m). At Isuzu Uganda which is into pickups and mid-range trucks and buses, prices for 4×4 pickups are at $75,000 (about Shs 270m) while the 4×2 go for $73,000 (about Shs 260m). Because of these high prices, only one in ten vehicles on the road is new and the majority of these belong to Corporate organisations, the government and international NGO. Yet, vehicle imports in the country have been growing at an average of 10.4 % per annum in the past three years driven by high demand for used vehicles as the middle class surges simultaneously with the growing economy. And, though the new government’s environmental tax could have led to a surge in demand for brand new vehicles, the customers are yet to take the opportunity to acquire the new machines, due to a combination of several factors. “Customers are willing to own new cars but the prices are still out of their reach. This has also been complicated with the weakening shilling and the high interest rate on loans,” a source, who declined to be named, said. Over the past nine months, the shilling has dropped 31.5% against the US dollar - now trading at Shs 3,610 - with the interest rates standing at an average of 21 % per annum. Benard Bwire, the accounting and administration supervisor at CFAO Motors Uganda Ltd, said the brand new motor segment is yet to feel the impact of the new tax. CFAO, which is planning to close shop in the country, as well as in Kenya and Tanzania in November, was selling the German made brand - Volkswagen. Toyota Tsusho, the Japanese conglomerate and a dealer of Toyota vehicles acquired a 97.81% stake in the French firm CFAO to help expand its footprint in Africa’s automotive and pharmaceutical distribution business. But Secretary to the Treasury, Keith Muhakanizi doesn’t have any regrets. He said the new tax imposed on the used vehicles is serving the exact purpose it was meant for. “The reason for environmental tax was to reduce the importation of used to conserve the environment. So, if there’s a reduction, then, it is doing exactly what it was meant to do,” Muhakanizi told The Independent. Revenue earnings from the environmental tax, according to URA figures, grew 43.5% to Shs 21.77 billion between July and Sep this year compared with the same period in 2014. Last month, Finance Minister Matia Kasaija said the government is inviting companies to set up assembling plants in the country to reduce the prices of brand new vehicles. In Uganda there are promises of a Revival of Uganda Airlines that President Amin established 1976 but was abandoned by successive governments for 40 years. to ensure that happens now 2015. Efforts to revive Uganda Airlines are underway, Daily Monitor has learnt. This newspaper has established that discussions on whether the government should lease or buy new aircraft have featured prominently in recent meetings. It has also emerged that Uganda Development Corporation (UDC), an institution charged with reinstating the national carrier, has only six months to complete this task. This means that by early next year, Uganda should be having a national airline in operation. Although the UDC executive director, Mr Fred Ogene, declined to comment on the timeline by which the national carrier would be operational, saying it is too early to talk about the timeline. He said there is goodwill at all levels of government to quickly re-establish the national airlines. “Government has agreed to put back the national carrier. And we (UDC) have been put in charge to ensure that happens. At the moment we are trying to establish its economic viability,” Mr Ogene said last week in an interview. Worth noting is that this is not the first time there is an attempt to restart the operation of the national carrier. In 2013, there were government plans to revive the carrier although the discussions did not happen until in October 2014, four months after Air Uganda licence was suspended by the Civil Aviation Authority due to safety concerns. Since then, till last week, not so much was being said about the defunct airline. The revival of Uganda Airlines comes in the wake of British Airways suspending flights between Entebbe International Airport and Heathrow, London, airport on grounds that the flights are not “commercially viable.” The suspension starts in October. British Airways has operated in Uganda for 24 years after re-launching its flights to Uganda in 1991. Uganda Airlines was the flag carrier of Uganda. It was established in May 1976, and started operations in 1977 with its hub at Entebbe International Airport. The Airline was founded as a subsidiary of the government-owned Ugandan Development Corporation (UDC) as a replacement of the services previously operated by East African Airways. In the wake of liberalisation, efforts were made by the government to privatise the company, but all potential bidders pulled out, leading to the eventual liquidation of Uganda Airlines Corporation in May 2001. Construction of the Standard Gauge Railway in Uganda is set to commence next month in Kampala, Works minister John Byabagambi has revealed. Speaking in Jinja Town on Tuesday, Mr Byabagambi said a Shs13 trillion loan to be secured from the Chinese government has already been approved by Parliament, paving way for work to kick off. The project contractor is China Harbour Engineering Corporation (CHEC). The minister said another Shs100 billion meant for compensation of people who will be affected by the project has also been secured. He said construction of the railway line, which will connect Uganda, Kenya, Rwanda and South Sudan, is expected to be complete in 36 months. The project will commence with the Kampala- Tororo axis. The minister, who was briefing stakeholders from Busoga sub-region, said the biggest challenge of the project so far is compensating people affected by the project. “The biggest challenge we are facing as the work starts is the wrong perception that government is grabbing people’s land in the areas where the line is passing,” Mr Byabagambi said. “But you stakeholders here, go and explain to people that everybody will be compensated, so no one should fight the project,” he added. The high capacity and affordable railway line will enable trains travel at a speed of 120 kms per hour and will reduce the number of days it takes to transport goods from Mombasa to Kampala to only two instead of the current 14 days. The Standard Gauge Railway, which is part of the Northern Corridor Integrated Projects, will start from the Port of Mombasa through Nairobi to Kampala. It will also traverse the Tororo - Gulu to Nimule up to Juba area in South Sudan and also from Kampala to Kasese on to Mpondwe in western Uganda, and then Kigali. It was stretch to Pakwach and the Democratic Republic of Congo border, and again from Mpondwe to the DRC border. The railway line will be constructed by the Chinese Harbour Engineering Company. Kenya launched the building of her Standard Gauge Railway line in October 2013. 20 taxi drivers have been arrested and blamed for the massive congestion in the city of Kampala, Uganda. Drivers of commuter taxis in Kampala have been advised to use the available parks. More than 20 drivers have been detained and at least 20 commuter taxis impounded following a new operation to end illegal parking and parks in the city. The operation code-named: “Off Illegal Parks”, which was launched by Kampala Capital City Authority (KCCA), started on Tuesday after the police and KCCA law enforcers closed the Namirembe Road park indefinitely. The KCCA deputy spokesperson, Mr Robert Kalumba, said the operation will sweep across the five divisions of Kampala. Mr Kalumba said the operation follows a directive by Ms Jennifer Musisi, the city authority’s executive director recently to all taxi operators in illegal centres to utilise the available taxi parks in Kampala. “We want to rid the city of all illegal parking centres and ease traffic movements in the city. The public should be part and stop waiting for taxis at illegal places. Besides, that is abetting crime and yet in the end, they blame KCCA of failing to crack whip on defiant taxi drivers,” Mr Kalumba said yesterday. However, the head of Kampala taxi drivers and conductors, Mr Mustapha Mayambala, said the parks are too congested to accommodate all the taxis operating in and around Kampala. Mr Mayambala asked KCCA to draw proper route plans for taxis before allocation and closing what he called “the alternatives to small parks in the city”. Kampala currently has six parks; the Old Taxi Park, New Taxi Park, Usafi Park, Namayiba Bus Terminal, Kisenyi and Nakawa parks. Ms Musisi recently said with the Usafi Park under KCCA management, they will review all the prices to level them to suit the population served. Other parks KCCA has listed for closure includeClock Tower Park, Burton Street Park, Cooper Complex Park and Bwaise parks. Why a Ugandan government can afford a functional railway transport for KAMPALA INTERNATIONAL CITY. A Japanese magnetic levitation train has broken its own world speed record, hitting 603km/h (374mph) in a test run near Mount Fuji. The train beat the 590km/h speed it had set last week in another test. Maglev trains use a electrically charged magnets to lift and move carriages above the rail tracks. Central Japan Railway (JR Central), which owns the trains, wants to introduce the service between Tokyo and the central city of Nagoya by 2027. The 280km journey would take only about 40 minutes, less than half the current time. However, passengers will not get to experience the maglev's record-breaking speeds because the company said its trains will operate at a maximum of 505km/h. Construction is estimated at nearly $100bn (£67bn) just for the stretch to Nagoya, with more than 80% of the route expected to go through costly tunnels, reported AFP news agency. Japanese Prime Minister Shinzo Abe is visiting the US on Sunday where he is expected to pitch for a role in building a new high-speed rail line between New York and Washington. This project fits well on the continent of Africa across North-South and East-West. Unfortunately in Africa, Japan is making enough money selling cars that are not good for the global environment. 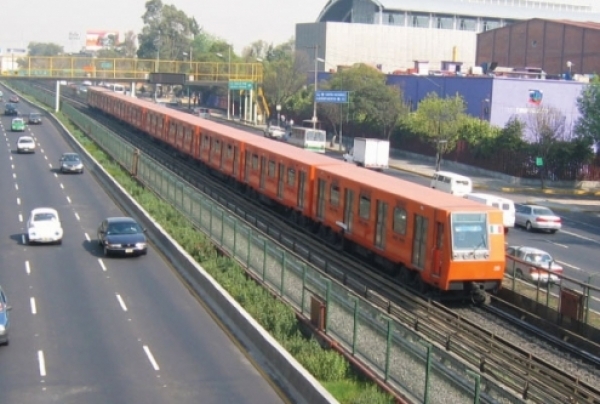 The Mexico Metro in Mexico, unlike the Delhi one, is built alongside the roads. Recently, the Kampala Capital City Authorities officials issued an artistic impression of how they plan to introduce fly-overs in the city to solve the traffic jam issue. However, that could not be the best solution. 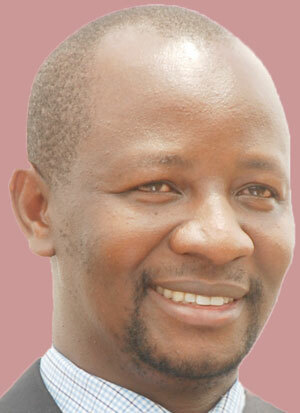 Sunday Monitor’s Emmanuel Ainebyoona looks at the possible options the Authority can explore. The proposed Kampala flyover project may not solve the transport challenge of traffic jams and congestion in the city unless government urgently invests in alternative means of mass public transport. Currently, the city’s main means of public transportation are 14-seater omnibuses and motorcycle taxis, popularly known as boda boda. They have enormous limitations in terms of passenger volume and come with a lot of safety risks and inconveniences. As a result, anyone who can afford an old used car, however crappy, is bringing it on the street and clogging the city’s roads further. A survey done in Kampala early this year by Iganga Foundation titled Smart Moving Kampala, indicates that 24,000 hours are lost each day by commuters due to traffic jams. It pointed specifically at areas near the Old Taxi Park where many streets are blocked by taxis (matatus) waiting to enter the park. This happens daily and the flow of traffic is impossible in the nearby streets. The situation is not any different at other major routes like Jinja Road – Wampewo intersection, Clock Tower, and KPC – Fidodido junction. Traffic jams have become a day-to-day, hour-to-hour menace here. Experts have already warned that the current flyover project will offer a short term solution to a long-term challenge. They give an example of Kenya, Uganda’s immediate neighbour which has already undertaken comprehensive flyover projects like Thika Express Highway. “Roads are becoming smaller and the situation is going to worsen. We need an alternative public transport system which will stop people from buying vehicles,” says Steven Kasiima, the acting head of Traffic Police. The same view is shared by Dr Kiggundu Amin Tamale, an architecture lecturer at Makerere University and a physical planning expert. He told Sunday Monitor that creating road space will not necessarily solve the transport challenge in Kampala without investing in alternative means. Thika Express highway, one of East Africa’s infrastructure masterpieces, has lived a lifeline of less than five years but is already experiencing heavy traffic jams at peak hours, a problem it was supposed to solve. Kenya has now turned to rehabilitating the colonial passenger train system alongside the new standard gauge railway aimed at linking Mombasa to Nairobi. After which, it will connect to the Uganda border at Malaba-Tororo, then Kampala and, perhaps, finally to Kigali. Currently, Nairobi operates several train stations: Nairobi Railway Station, Syokimau, Makadara, Imara Daima, Kahawa, Dandora, Embakasi and Kikuyu. On average, about 19,000 passengers are transported per day to and from the outskirts of Nairobi by train. This is still small compared to other cities in the world with well-established metro systems but it points to future of urban transportation in Africa. Nairobi commuters interviewed by the Sunday Monitor said the train is the most cost-effective public transport system in Nairobi with fares as low as Kshs20 (Ushs600). Uganda has about 1,600km of narrow or metric gauge (1,000mm) railway network, only 330km, less than a quarter is being used for freight services. The one under use is mainly the 190km between Kampala and Tororo-Malaba at the Kenya border. It has other existent but non-functional train routes, Tororo-Mbale-Gulu-Packwach, Kampala-Kasese, Kampala-Port Bell, Kampala-Nalukolongo and Jinja-Mbulamuti-Busembatia (also referred to as the Busoga loop). A section of the public opines that the huge funding earmarked for the flyover project would rather be injected building a light railway system which will in return reduce congestion on the Kampala road network. Japan International Corporation Agency (JICA) has already offered a Shs300 billion grant to Kampala Capital City Authority (KCCA) to finance the construction of the flyovers on Jinja Road – Wampewo junction - Mukwano roundabout and Clock Tower junction on Entebbe Road. Of course, many people will be quick to point at the big cost of such a project and argue that the country does not have money for projects of this magnitude. Interestingly, that is not so; Uganda can afford to put money in long-term city transportation solutions as more money is being spent on less long-term projects, not to mention how much is stolen or misused. When the Sunday Monitor asked Kampala executive director Jennifer Musisi at a media interaction organised by African Centre for Media Excellence on Wednesday whether by pursuing the flyover project KCCA was not throwing good money into a short-term solution for an otherwise long-term problem, she said that was the work of government and other government agencies to invest into railway systems. Ms Musisi said as far as they were concerned, JICA had offered to build flyovers and they will follow that, hoping that someone else will offer more money to build a city metro for the long term. The average cost of constructing a double rail track in Africa’s recent railway projects [Lagos-Kaduna and Abuja-Kaduna] stands at $3.5 million per kiliometre [about Shs8.75b]. The Kampala flyover project is expected to cost about $150 million [about Shs375 billion]. This means this money can fund construction of a double-track of railway line of about 42km. This is slightly shorter than the Kampala-Entebbe Expressway, which is projected to be 51km. The Expressway, whose construction is underway, is expected to cost $476 million (Shs1.19 trillion), the project is likely to be complete by 2016. It is funded by Chinese government through a concessional loan. The project will attract a 2 per cent interest rate repayable to the Exim Bank within 40 years. The road will attract road toll payable by motorists and commuters interested in accessing Entebbe International Airport within 30 minutes. The six-lane road will cost $9.33 million per kilometre, this is triple the average cost of constructing a double-track dual-gauge railway line in recent projects in Africa. A dual-gauge railway is a line that provides for trains to move in two different directions. This means had the government chosen to put this money into building a railway system, then it could use more or less the same money to build light double railway lines on Kampala-Entebbe, Kampala-Jinja, Kampala-Kyengera, Kampala-Gayaza and Kampala-Port Bell routes. So what Kampala needs to tame the current traffic mess is invest in a commuter light train system – a Kampala Metro! The Kampala Metro system can cover the Kampala-Entebbe (42km), Kampala-Gayaza (20km), Kampala-Nabbingo (25km), Kampala-Bujuko (25km) – this is along the Mityana highway, and Kampala-Mukono (25km). In total, this 142km would cost government approximately $497 million, slightly higher than the cost of Kampala-Entebbe Expressway which in any case is not a mass transportation system and is largely aimed at making life easier for those going to the airport and to State House Entebbe. Bureaucrats and many short term thinkers will say a lot more money will be needed to compensate for land and other properties along the construction line but that should not hold the country hostage. In many places, part of the road reserve could be used and any property within the reserve should be pulled down without compensation. The Nairobi-Mombasa Standard gauge is expected to run besides Mombasa highway. This can be adopted for Kampala. However, the cost of an inter-city railway varies depending on the size, type and nature of technology to be used. Most developed countries like France, UK, US and Japan, use the high speed line technology which is very expensive. For example, The Haikou-Sanya 308km High Speed Line cost the Chinese $10 million (about Shs2.5b) per kilometre. Large cities often build metro systems known as underground, subway or tube. The trains are electricity powered by a third rail. They are also separate from other traffic usually without level crossing. They run through tunnels and sometimes on elevated structures (overhead-rail lines). Underground and elevated railways are more expensive compared to level railway lines common in African countries. Rail lines vary in size by gauge namely; broad gauge 1,676mm, Standard gauge 1,435mm, and narrow gauge 1,000mm. This implies that Uganda can afford rehabilitating the current train routes for passenger purposes basing on the relative costs involved. Rift Valley Railways (RVR) took over the management of the Uganda railway transport from Uganda Railway Corporation in November 2006 after acquiring 25 years of concession. 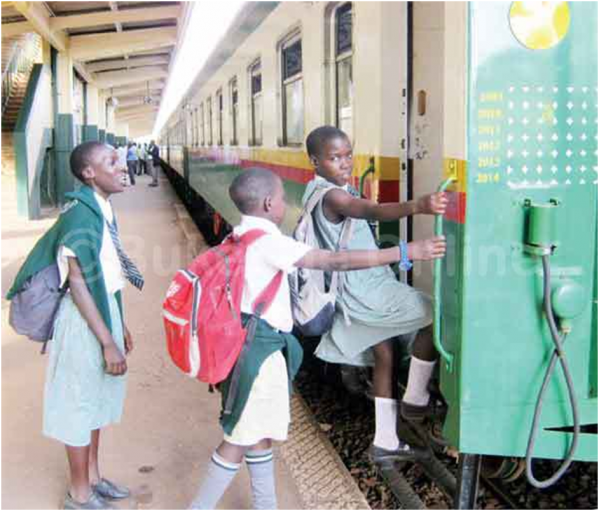 The same company is currently operating passenger trains in Nairobi, Kenya’s capital. On the Ugandan side, not a lot has been done. In an interview, RVR Western General Manager Mark Rumanyika told the Sunday Monitor that unlike Kenya, RVR in Uganda was not offered a passenger licence as part of the concession in 2006. “We are in substantive discussions with stakeholders, mostly KCCA, to have operational passenger trains by the end of this year,” said Mr Rumanyika. Commenting on the passenger trains used to ferry people to Kampala after a taxi operators’ strike a year ago, Mr Rumanyika said government called upon RVR for help and offered them a licence to operate during the strike period. “We are eager to partner with government to offer our services to the people of Kampala and residents in the outskirts once we get a passenger train licence. We currently have five new coaches parked. We also used them during the Kampala City carnivore to transport people,” he added. Mr Rumanyika said the line between Tororo, Gulu and Packwach is only awaiting Uganda National Roads Authority (UNRA) to conclude refurbishments of railway crossing intersections. Many experts argue that with good political will, the country can invest in building extra lines of the rail line intercrossing Kampala. Advances in technology have also lowered the cost of operating a train transport system, previously trains were using coal but lately, they are electric powered. Uganda has greater hydro-power potential to sustain a train system. The existent rail track can still be upgraded to support train coaches that are electric powered. Elsewhere in the world, countries like Nigeria, Libya, Ethiopia, China, and India have embarked on constructing and rehabilitating their railway transport systems. The Railway Gazette website lists a 2009 project in Afghanistan as one of the recent railway construction works. The 75km single-track project cost $170 million, slightly higher than the Kampala-Jinja flyover project. In 2008, Libya began a railway project; a standard gauge, double-track line awarded to Russia Railways for a cost of 2.5 billion Euros ($2.8billion) for 554km. This will cost $5 million per kilometre. It later signed another contract in 2009 with China Railway Construction Corporation for $805 million for 172km railway from Tripoli-Ras Edjer at $4.7 per kilometre. Furthermore, India Railways has operated a functional train system for many years. It is now planning to introduce new coaches using German technology and phase-out the locally made Linke Holfmann Bush (LBH) Coaches. The LBH coaches have a lifeline of 25 years and cost around Rs1.5 Crore (Shs150 million) per coach. 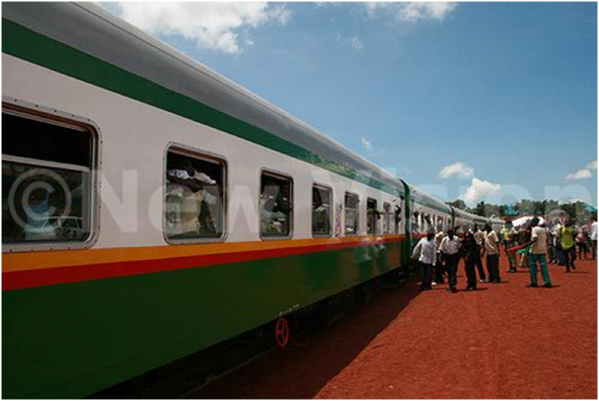 The new LBH AC coaches cost about Rs2.5crore (Shs250 million). They can serve a period of 30 years. Uganda can consider investing is such a long lasting solution to the transport problem in Kampala and beyond as opposed to creating road space. According the national census of 2002, the population of Kampala stood at 1.2 million people, with the latest estimates projecting it at two million. With a 3.6 population growth rate, Kampala will have an additional one million people in the next 10 years, who will exert more stress on the current road network. wano e Buganda ne Kenya. ABANTU abasoba mu 10,000 be bagenda okukosebwa mu nteekateeka za KCCA ez’okuzzaawo eggaali y’omukka z’erangiridde mu butongole. Abasinga ku bano be baazimba okumpi n’olugundo lw’eggaali y’omukka nga kati balina ennaku 19 zokka okwamuka ebitundu bino. Ekiragiro ekyassiddwaako omukono gw’akola nga dayirekita w’okuteekerateekera Kampala, Moses K. Atwine (ne kifuluma nga July 1, 2014), KCCA yalagidde ebizimbe n’ennyumba byonna ebiri mu kibangirizi kya mmita 30 erudda n’erudda w’oluguudo lw’eggaali y’omukka bimenyebwewo mu nnaku 28 nga zino zaatandika okubalibwa okuva nga July 1 omwaka guno. Abatuuze babadde bakyabiyita bya mannyowenu ate eggulo, amyuka omwogezi wa KCCA, Robert Kalumba n’addamu n’aweereza ekiwandiiko ekirala eggulo ng’ekkaatiriza ekyasooka. Mu kiwandiiko kino, KCCA ezzeemu okukola okulabula okusembayo eri abantu abeesenza ku ttaka ly’eggaali y’omukka. Aba KCCA nga bali wamu n’ekitongole kya Rift Valley Railways (RVR), bagamba nti bazze balabula abantu bano okuva mu 2012 era ne nga July 1, 2014, baatadde ekirango mu mawulire nga kati waliwo okulabula okusembayo. Abaneesisiggiriza bagenda kubasengula ku kifuba, ennyumba oba ekizimbe kye kimenyebwe awatali kuliyirirwa wadde ennusu. Ebitundu okuli Bbanda, Kinnawattaka Mbuya, Kataza, Namuwongo, ekibangirizi kya makolero (Industrial Area), Nsambya, Namuwongo, Lukka okumpi n’e Bugoloobi, Kibuye, Ndeeba n’e Nalukolongo. Ebizimbe ebimu okuli eby’amasomero n’abamu abaazimba amasomero ku ttaka ly’eggaali y’omukka bonna baakusengulwa. Wabula abamu ku batuuze b’ebitundu bino batuula bufoofofo era nga bulijjo abamu baafunye dda balooyo, abagamba nti bagenda kubalwanirira. Bangi bagambye nti tebasobola kuva ku ttaka lino nga tebaliyiriddwa. Annet Atwine omu ku balina ekibanja e Kinnawattaka yategeezezza nti, nze sisobola kuva ku kibanja kyage nti kuba KCCA eragidde tuveewo mu nnaku 28 olwensonga nti balina okutuliyirira era twagulawo na sente okuva ku ba nnannyini bibanja abaasookawo. Yagasseeko nti ku mulundi ogwasembayo, baawulirako nti ne Bbanka y’Ensi yonna (World Bank) yateekawo obuwumbi bw’ensimbi obuwerako okuliyirira abantu abalina ebibanja ku leerwe. Ali Kiberu, ssentebe wa LC II mu muluka gwa Bbanda B ye yategeezezza nti abantu abasinga abajja ku nkingizzi z’oluguudo lw’eggaali y’omukka abamu baagulanga ku bannannyini bibanja ate abalala bo abavunaanyizibwa ku kulabirira oluguudo be baabaguzanga. Ayongerako nti, naye kino abantu baakikolanga nga balekayo mmita 6 abavunaanyizibwa ku luguudo lw’eggaali ze baabalagira okulekayo era bo bulijjo bakimanyi nti ze balina okulekayo wabula mu kiseera kino buli omu kyamwewuunyisizza bwe baabawadde ekiwandiiko ekigamba nti buli ali mu kibangirizi ekya mmita 30 buli ludda lwa ggaali. Pauline Nannyonga, ow’ebyokwerinda e Kataza okumpi ne Bugoloobi mu Nakawa, agamba nti ku lugundo kuno kuliko bbaala nnyingi ng’oluusi abatamidde bakoonebwa eggaali y’omukka kuno kw’ossa obucaafu obususse kuba abasinga tebalina kaabuyonjo. OBULUMI n'essanyu byetobese mu pulojekiti ya KCCA ey'okusengula abakolera mu kibangirizi ky'eggaali y'omukka esuubirwa okutandika mu bbanga lya nnaku 10 zokka okuva kati. Pulojekiti eno wadde abamu balowooza nti egendereddwaamu kunyigiriza, bangi bagiraba ng'amakula eyalwawo edda okutandikibwa kubanga ejjuddemu ebirungi eri eggwanga lyonna. Egenda kuwewula ku bulippagano bwa mmotoka obuludde nga butawaanya Bannakampala era abasaabaze bangi bagenda kulinnya ggaali ya mukka okutuuka mu Kampala n'okubazzaayo awatali kukwatibwa jaamu. Ebisale ebisuubirwa okutambuza Bannakampala bigenda kuba wansi wadde bikyakubaganyizibwako ebirowoozo. Tikiti esuubirwa okuba ku 1,500/-. Endabika y'ebibangirizi ebibadde bizimbiddwaamu abantu egenda kukyuka, ekibuga kitemagane nga bwe kiri ku bibuga ebirala. Abantu bagenda kufuna emirimu naddala abo abasobola okulabirira n'okukulaakulanya ssaako abakola mu biyumba by'eggaali y'omukka. za Uganda ezijjako abafuzi abaganidde mu State House. Obubenje bugenda kukendeera ng'abantu batambula bulungi awatali kunyigirizibwa. Obubbi mu takisi ne ku makubo bigenda kufumwa kubanga poliisi y’egenda okukuuma abasaabaze mu biyumba bino okukakasa nti batambula bulungi. Mu kiwandiiko kya KCCA kye yafulumizza, abasaabaze abasoba mu 10,000. buli lunaku be basuubirwa okutambuzibwa eggaali y'omukka nga yaakatandika. Omumyuuka w'omwogezi wa KCCA, Robert Kalumba yagambye nti eggaali esuubirwa okutandika ne luutu nnya olunaku. “Tugenda kutandika n'emirundi ebiri ku makya n'olweggulo kyokka ebintu bwe bineeyongera okutereera nga twongerako," Kalumba bwe yagambye. N'ategeeza nti pulojekiti eno bagenda kugikolera wansi n'ekitongole ekiddukanya entambula y'eggaali y'omukka mu ggwanga ekiyitibwa Rift Valley Railways (soma RVR). Yagambye nti okutandika ebibangirizi byonna biteekeddwa okusengulwamu abantu era bavudde mabega nga balabulwa okuvaawo. "Twasooka kubategeeza basenguke mu ddembe mu 2012. Twabaddamu mu 2013. Kati tubawadde ennaku 28 okwamuka ekifo kino pulojekiti etandike, " Kalumba bw'ayagasseeko. Akulira ekitongole kino Mark Rumanyika yategeezezza nti KCCA erina obuyinza bwonna obukulaakulanya ekibuga era entegeka ezisinga ezirimu wadde bakolaganira wamu nabo. "Bannakampala bagenda kufuna kinene mu pulojekiti eno era bagiwagire, " Rumanyika bwe yabakubirizza. ABANTU abasoba mu 60,000 be bagobeddwa era bakaaba nti tebamanyi waakudda okuggyako nga KCCA ne RVR babawadde ebbanga erimala okwetegeka oba okubagulira ettaka basenguke bulungi nga tewali akukkuluma. Emiwendo gino giweebwa bakulembeze abatwala ebitundu omuyita eggaali eno. Ebibangirizi bino mulimu obutale, amayumba agasulwamu, abooza mmotoka n'abasimba ebimuli bonna bagobeddwa. Omu ku bakulembeze b'akatale k’omu Ndeeba, Fred Kazibwe yagambye nti KCCA ekimanye nti abantu abo bakkirizibwa mu mateeka okukolera mu bibangirizi ebyo. "Twasaba mu butongole ne tusasula ne ssente era tubadde tukolera wano mu mateeka. Twakyaza ne Pulezidenti Museveni mu katale wano era tumanyiddwa buli wamu. Eby'okumala gatugoba tetubikkiriza," Kazibwe bwe yagambye. Yawagiddwa abakulembeze mu bitundu ebirala omuyita oluguudo luno ne bategeeza nti tebawakanya nkulaakulana naye babawe obudde ate balowooze n'okubagulira ettaka awalala basengukireko kubanga eno pulojekiti ya gavumenti. Omu ku batuuze Yafesi Lukutira era ssentebe wa Kinnawattaka Zooni 1 mu muluka gw’e Mbuya 1 yategeezezza nti baagenda mu kitongole kya KCCA okulaba akola ku kuteekerateekera ekibuga, Annet Atwine wabula teyabawulirizza okuggyako okubalabula nti aneesigiikiriza y'anaamanya ebinaddirira. Yagambye nti tebagaanye kusenguka naye babongere ebbanga kubanga balinako ebintu bingi ku ttaka lino. Ate ssentebe wa Banda Zooni III John Alya yategeezezza nti tannaba kumanya batuuze gye bagenda kusengukira kubanga obudde bwe baabawadde butono ate bubasanze tebeetegese bulungi. BANI ABABADDE BAFUNA MU BIBANGIRIZI BINO? ABAMU ku basuubuzi baategeezezza nti bassentebe b’obutale n’ebyalo omuyita oluguudo lw’eggaali be babadde basinga okufunamu. Okufuna ekifo obadde oteekwa kusasula naddala mu katale ate n’osasula ne ssente endala eza buli mwezi. Abamu ku bakungu abaali mu KCC enkadde. Okufuna ekifo w’osimba ebimuli n’okwoleza mmotoka ng’oteekwa kusasula ssente. Abalala bakungu mu kitongole ky’eggaali y’omukka. Ab’akatale ka Ndeeba balina ebbaluwa eraga nti baasasula ssente 400,000/- okubakkiriza okukolera mu bibangirizi ebyo mu mateeka era bagamba nti bo basooke babagulire ettaka basengukireko. ABANTU BAASENGA BATYA KU TTAKA LY’EGGAALI Y'OMUKKA? David Kiberu Ssentebe wa Kinnawattala ye agamba nti oluguudo luno bwe lwali lukolebwa mu myaka gya 1930 bajjajjaffe baawaayo ebibanja byabwe ne bayisaamu oluguudo luno kuba entambula yali ya bwereere. Era tewali alina kiraga nti ettaka lino bajjajjaffe baali baaliguza ekitongole ky’eggaali y'omukka ate lwayitanga mu bibanja byabwe wakati. Ab'ekitongole ky’eggaali y'omukka waliwo lwe bajja ne balagira abantu okuvaawo nga kino bakikoze emirundi esatu era n’olwasembayo baagenda bakuba buli omu obufaananyi nga batusuubizza okutusasula. Rehema Naigaga ye agamba nti nze n'omwami wange tumazeewo emyaka esatu era nga twagula buguzi ekifo ku bukadde 3 ne tuzimbamu amaka era ng’omukyala eyatuguza abeera Kitintale. N'abasinga mu katundu kano ye yabaguza. Kati olwo tulage wa? Deborah Nalubowa agamba nti abantu abasinga naddala e Banda bajjawo ne bakolerawo obulimu obutonotono ng'okulimirawo n'okubajjirawo era bwe bakolerawo emirimu gino ab'ekitongoke ky’eggaali babategeeza nti bakolerewo naye tebazimba mu kibangirizi ekya mita 15 okuva ku luguudo era abasinga bwe baakola. Ekyavaamu waliwo abantu ssekinnooomu abaatuukirira abakungu b'ekitongole ky’eggaali y’omukka okutandika okuzimba mu kibangirizi ekya mita 15 ekyali kisigaddewo ne babakkiriza naye ne babagaana okuzimbawo amayumba ag'obuwangaazi kuba ekiseera kyonna gaali gaakumenyebwa. Kati ekya KCCA okugamba mita 30 buli luuyi nze ndaba kiyitiridde kuba ne leerwe ebadde ejja naye ng'etugamba eyagala mita 15. BAKANSALA ba KCCA ensonga bagyanjulidde pulezidenti Museveni ne bamutegeeza nti pulojekiti y’okuzzaawo eggaali y’omukka nnungi. Wabula baamusabye akkirize abantu abamu baliyirirwe naddala abo abalinako amayumba ag’obuwangaazi n’ebiwandiiko ebyenjawulo ebikakasa obwannannyini. Kansala w’e Nakawa Emilly Babirye yeegayiridde Pulezidenti n’ayagala n’okufukamira nti wadde pulojekiti nnungi era naye agiwagira naye waakiri gavumenti eyambe abo abagenda okusengulwa ebaliyirire kubanga gavumenti ssente ezirina. Babirye yanokoddeyo abatuuze b’e Kinnawattaka abasoba mu 10,000 ate nga balina amayumba ag’obuwangaazi n’agamba nti basooke bayambibwe nga tebannaba kugobwa. Ate Kansala Godfrey Asiimwe eyayanjudde ensonga ku lwa banne yagambye nti Pulezidenti yakkirizza okutunula mu nsonga z’abalina amayumba n’ebiwandiiko ebituufu era n’alagira nti agenda kwongera okuzeetegereza. KAYOOLA yakyaka nnyo mu myaka gye 80. Okusooka waabangawo eggaali y’omukka eyatwalanga ente n’embuzi e Kasese naye olw’ebbula ly’ebyentambula eno yaleetebwa mu Kampala n’etandika okusomba abantu. Eno teyabangamu ntebe ate ng’eyimirira ku siteegi n’eyoola abantu ekyavaako erinnya kayoola. Kayoola yakeeranga ku ssaawa 12:00 ez’oku makya era ng’etuuka mu Kampala ku ssaawa 1:30. Zino zaabanga bbiri. Emu yavanga Mukono, ng’erina siteegi; Namanve, Bweyogerere, Kireka, Bbanda, Mbuya,Wankulukuku okutuuka ku kitebe ku Leerwe. Waliwo n’endala eyavanga e Kyengera, Busega, Kibuye nayo n’ekoma ku Leerwe. Okusooka zino zaasabanga 50/- naye ne zirinnya ku 100/-. Kayoola zino zaatambulanga ku makya n’olweggulo era zettanirwanga nnyo abaana b’essomero n'abakozi. MPs drive on the Mukono-Katosi road last week. They had visited the road to ascertain if construction had commenced. The Uganda National Roads Authority (UNRA) Board has suspended four top officials following the controversy surrounding the tender for the construction of the 74km Mukono-Katosi road. The UNRA board, chaired by Ms Angella Kiryabwire, decided to suspend acting executive director Ssebugga Kimeze, the director of Finance Mr Joe Semugoomu, the director of planning Eng. David Luyimbazi, and Legal Counsel Mr Marvin Baryaruha, until investigations into the award of the tender are concluded. Ms Kiryabwire on Friday morning said she was still chairing the board meeting that was sitting for the second day running and could not give a substantial comment about the latest developments. She reffered this newspaper to UNRA director of communications Mr Dan Alinange. Mr Alinange confirmed the development. “Yes it is true but we have issued a press statement to the media,” he said. The statement did not named the suspended officers. Sources in the board meeting told Saturday Monitor that the board had appointed Eng James Okiror, the UNRA director of operations as acting executive director. All the suspended officials were asked to hand over office and leave on Friday. This follows a directive by the Inspector General of Government, Justice Irene Mulyagonja, to the UNRA board chair to act on the said officers. “I told them [UNRA board] to suspend them until we conclude the investigations or until we see its okay for them to get back to office,” Justice Mulyagonja told Saturday Monitor. Secretary to the Treasury Keith Muhakanizi a month ago wrote to the IGG asking her to investigate reports that the performance guarantee by Eutaw had failed and that the money deposited in Housing Finance Bank had all been withdrawn. The police and the Inspector General of Government are investigating corruption allegations and whether the American construction company Eutaw that won the tender, exists. The police is also investigating circumstances under which Shs24.7b, was advanced to the company after the bank guarantee had been withdrawn. The Police Special Investigations Unit has since questioned several officials, including Mr Semugoomu, and the UNRA accountant Wilberforce Senjako in connection to the payment. Others questioned include Mr Luyimbazi, and Mr Apolo Ssenkeeto, who claims to be the representative of Eutaw Construction Company in Uganda. The police has also questioned officials of Housing Finance Bank and insurers - Statewide Insurance Company (SWICO) and UAP insurance company over the issuance of bonds that were used to get the Shs24.7 billion. But UAP insurance claimed that they discovered irregularities and cancelled the bond. The board last week asked the top managers to explain why Eutaw was paid Shs24.7 billion even before the UNRA officials carried out due diligence, which has led to financial loss. The board also wants officials to explain why the money was released after the bank guarantee issued by Housing Finance Bank had been withdrawn. According to internal UNRA communications, Mr Baryaruha had in a December 4 memo to then acting Executive Director Eng Luyimbazi, asked to travel with Mr Kirumunda to the US to do due diligence. However, Eng Luyimbazi asked that the team first confirms with the US based company the date they would be able to receive them. Eng Luyimbazi on December 5 wrote to Mr Thomas Elmore the Eutaw Chief Executive Officer asking when the company would be ready to receive the verification team. “The purpose of this letter is to seek your availability to meet and interact with our officials in this regard,” Eng Luyimbazi wrote. Mr Baryahuha says the team has since never travelled after Eng Luyimbazi’s directives. UNRA officials also say they signed the contract because Works minister Abraham Byandala expressly directed in a November 14, 2013 letter that the contract can be signed before due diligence was done. Mr Byandala has been in the spotlight for disregarding public procurement procedures by directing the roads authority to sign the contract but the minister said he had been advised that the contract could be repudiated if at a later stage, the due diligence report indicated that those representing the company did not have the authority to do so. Mr Byandala, also faulted his predecessor, Mr John Nasasira, and the minister for the Presidency, Mr Frank Tumwebaze, for orchestrating a smear campaign against him. Both Mr Nasasira and Mr Tumwebaze have since dismissed the accusation, saying Mr Byandala is using their names as a scapegoat for his woes and asked the embattled Works minister to take responsibility for his actions. The Finance ministry has since blocked the release of more money to the company after reports emerged that government could have signed the deal with a fictitious company purporting to represent Eutaw in Uganda. There are about 100 Pioneer buses parked and refused to work by government in Uganda. However, even after the beleaguered company resumes operations, following a nearly two year interruption, it is likely to lock horns with Kampala Capital City Authority (KCCA) over conditions in the new contract. One of the likely sticking points is the gazetting of bus lanes to enable Pioneer Easy Bus (PEB) commuters to ply the minimum number of daily trips agreed upon in the contract. In an interview with The Observer on Wednesday, the PEB corporate and legal affairs manager, Esther Kemigisha Tayebwa, said KCCA would have to fulfil its end of the bargain on bus lanes. “We have an agreement that is giving the [bus] lanes; so, it is an issue of ‘if you are not giving the lanes, then you cannot really expect money from us’ kind of thing,” she said. According to the contract between KCCA and PEB, the latter is to remit Shs 300,000 per bus to the city authority on a monthly basis. That money is independent of the taxes that it is expected to pay to URA. Tayebwa added that once PEB resumes operations, the company will need to erect bus terminals in different parts of the city, which is likely to put them at loggerheads with a city authority undertaking road infrastructure re-development works. “We just have to look for land, but KCCA has plans to do their own so that contradicts our own plans. We will see how to share,” she said. Having started operations in early 2012 as the contracted provider of public transportation in Kampala, PEB ran into trouble with Uganda Revenue Authority (URA), barely a year later. In February 2013, URA impounded 100 PEB buses over failure to pay tax arrears amounting to Shs 8 billion. PEB’s tax troubles have since been sorted. In March 2014, PEB signed a memorandum of understanding with URA, giving the bus company the go-ahead to resume operations whenever they were ready. “We will pay our taxes four months from the time we start operations,” Tayebwa said, adding that the MOU was valid for two years. Plans to resume operations early this year were, however, put on hold, pending a review of the contract signed with KCCA. According to Tayebwa, a new contract needed to accommodate the interests of authorities in Mukono and Wakiso, since PEB buses would ferry passengers to and from the two districts as well. “We realised that KCCA’s boundaries are limited to Kampala and yet the buses were going to Mukono and Wakiso,” she said. In response, KCCA spokesman, Peter Kaujju, said KCCA has not been directly involved in any negotiations between PEB and authorities in Mukono and Wakiso. “As regards the neighbouring districts, it is a matter outside the jurisdiction of KCCA but consultation is ongoing. Pioneer is at liberty to engage with them,” he said. The fresh contract, although eventually drafted and agreed upon by all four parties, could not be signed until the government had revised its Road and Public Safety Act to regulate the activities of city commuter buses. Kaujju said the city authority “has only just learnt” of the statutory instrument by the ministry of transport on buses amending the city bus transport regulations of 2011. “We are reviewing it with a view of engaging Pioneer [bus] on modalities regarding the resumption of services,” he noted. Nevertheless, Tayebwa says they have cleaned up their house and are only waiting for KCCA and their counterparts from Mukono and Wakiso to set a date when they can sign the contracts that will pave the way for resumption of their services. Asked how they would resume operations before KCCA fulfils pending issues such as bus lanes and terminals, Tayebwa said they would “have to enter negotiations” to ensure that those conditions are met along the way. At the time of its suspension, PEB had purchased 100 buses and planned to bring in a similar number, progressively, until it met the 522 total agreed with KCCA. With some of the buses purchased using bank loans, Tayebwa said PEB shareholders had had to shoulder the burden of repaying the banks during the suspension of its services. “This was a financed business; so, it is still being charged monthly. Shareholders are chipping in but also the banks have been kind enough to halt some of the penalties. We are looking at only the interest,” she said. PEB, who vacated their offices at Plot 31, Mpanga Close, Luthuli avenue in Bugolobi, sent its staff of at least 400 personnel on indefinite unpaid leave, pending a resolution of the problems that halted their work. Tayebwa said all their employees who were still available would get their jobs back when the company resumes operations. According to Tayebwa, the company will be under largely new management when it returns to work, and is currently improving its transport fare management systems. 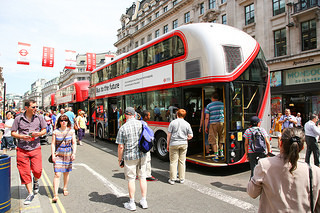 More new buses drive down emissions in London, UK. More iconic New Routemasters are set to hit the London capital's streets. By mid-November, route 453, between Deptford Bridge and Marylebone station, will be served entirely by the new open-platform buses. During peak hours, 35 of the state-of-the-art New Routemasters will be in service, carrying the 28,000 passengers who travel on the route each week day. The buses will operate with the rear platform closed when moving, with large numbers of passengers able to quickly board and alight at bus stops using all three sets of doors and two staircases. The introduction of the new vehicles is part of a programme to reduce emissions from London's bus fleet. The average fuel consumption is almost 50 per cent lower than the buses that operated on the routes before them. Eight bus routes are currently being served by around 260 New Routemasters. Route 453 becomes the ninth. TfL has committed to introducing 600 New Routemasters on the capital's streets by 2016, which will reduce CO2 emissions by around 20,600 tonnes a year. Why in Kampala city in Uganda, taxi drivers keep hiking fares: (Ennaku yo munaku tegya kuggwa wano). A passenger pays the fare. Many passengers find that the charges increase, at peak hours, on rainy days and during festive seasons. Oluguudo okuva ku nkulungo y’oku Bbiri baalutekamu ebyuma ebirwawulamu emirundi ebiri nga buli ludda lutambuza mmotoka bbiri wabula ebifo ebisalibwamu abantu okugenda okugula emmere n’ebintu ebirala baalekawo bisatu ekisooka kiri mu maaso g’essomero lya Yudesi, mu maaso ng’essundiro ly’amafuta (Shell) n’ekirala kiri kumpi n’ekikubo ekidda ewa Kibe nga waakava ku nkulungo y’oku Bbiri nawo baateekawo. Wiiki eno aba UNRA baasalawo okuziba ebifo bino ne bateekamu ebyuma ne balekawo omuntu w’ayinza okwenyiga n’ayitawo nga kino kati kyongende okugoba abantu ababadde bagula emmere ku Kaleerwe okuddukira e Bwaise ng’abamu bagamba nti tebalina gabuuka byuma. Okuva lwe baateekawo ebyuma bino abasuubuzi bagamba nti abaguzi abasinga baabaddukako naddala ab’emmotoka nga tebalina we bayisa mmotoka ate n’ebifo ebisimbwamu mmotoka nabyo bagamba nti baateekawo bitono nga bw’oba ova Gayaza olina kusimba ku siteegi eri okumpi n’oluguudo lwa Mawanda. Ibrahim Kamihanda omumyuka wa meeya w’e Kawempe, yategeezezza nti aba UNRA be baatadde ebyuma bino mu luguudo okusobola okuziyiza aba bodaboda, ab’ebigaali, ababadde bavaako obubenje mu bifo abantu we basalira. Yagambye abantu baabalekeddewo amabanga we basobola okusalira. Ebyuma ebyawula oluguudo bibobbya ab’oku Kaleerwe omutwe. Okuzimba subway ne pedestrian flyover ku dual carriage ways kiyamba abatuuze bano abasiiba babonabona ne nzimba eya Laisi eri mu kuzimba enguudo ze kibuga Kampala. Back to 1926. Did you know that the famous Kalerwe Market on Gayaza Road was once a train stage and that it is where the suburb draws its name? That there was a train station in Gayaza Trading Centre and that at one time there was a railway from Kampala to Bombo via Mulago-Kawempe? The construction of the Uganda Railway in the hinterland opened new private ventures of owning private railways, spreading out in other parts of the country feeding onto the main line. For the case of Uganda, two such railways were constructed. They included the Port Bell-Kampala (Mono Rail) which operated between 1909 and 1914 and the Kampala-Bombo (Road-Rail) that operated from 1923 to 1926. The construction of the Kampala- Bombo road-rail was as a result of the consistent demand from the Uganda Chamber of Commerce and the Planter’s Association to the legislative council. A trial stretch was laid in 1920 from Kampala to Kawempe though the line from Kampala to Bombo did not operate commercially until April 1, 1923. The following year, a branch of the Kampala–Bombo line to Gayaza was opened. This line was built mainly to facilitate the transportation of cotton from Bulemezi to Kampala, though there are speculations that it was built to ease transportation of military hardware to Bombo, hence it being known in some circles as the military railway. Writing in the Uganda Journal of March 1963, W. J. Peal says the railway used the Loco-Tractor system invented by Frank Duntton of the South African Railways Motor Transport Department. While going for his annual leave in 1919, governor Sir Robert Coryndon left instructions with the then director of public works (the equivalent of minister of Works) Mr Claude Espeut to go ahead with experiments on the railway as soon as possible. Tracks were bought from the War Salvage Board for experimental purposes and a 300-yard (274-metre) track was laid near the Kampala station for the trials which were carried out in February 1920. The secretary to the colonies having got the report from the acting governor informed the Uganda Chamber of Commerce that such a venture was not going to be possible. In his cable to the governor, on leave in London, dated March 10, 1920, the secretary told governor Coryndon that “no progress was being made with the Loco-tractor experiment since proofs of successful works would have to provide strong reasons for loan assistance for the development of internal transport”. However, the governor insisted on having the project continue and he directed the director of public works to go ahead with the construction of a five-mile track, against the advice of all those concerned with the improvement of transport system in the country. The Uganda Herald of March 26, 1920, voiced the concerns about the Uganda Development Commission about the commercial viability of having such railway transport in the country. According to Peal, two people influenced the governor in disregarding the advice against the project. “First was Frank Worthington, the governor’s brother in-law, acting on behalf of road-rail Company in Uganda, who in September 1920 had applied to have his company construct the Mbale-Majanji railroad. The other was Major E. A. T. Dutton, the secretary to the governor and a relative to Frank Dutton, the inventor of the railway system,” Peal says. By the time of Coryndon’s return from leave, the track from Kampala to Kawempe was complete and the trial run was done in August 1920. The experiment locomotive was a converted Ford Box motorcar from which the front axle and wheels had been removed to fit a rail bogie. The experiment journey from Kampala to Kawempe was covered in 12 minutes with a cotton cargo of three tons. 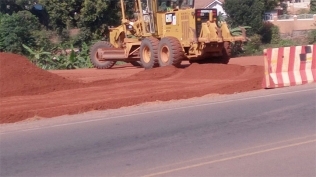 In the Chamber of Commerce’s next sitting after the experiment from Kampala to Kawempe, it was resolved that “the chamber approves of the decision of the government to order a further 50 miles to be laid along Bombo Road. The chamber would welcome the opportunity of giving its opinion on the most suitable routes for any extension to be placed”. Sir Coryndon’s interest in the railway became a point of discussion in all his speeches after the experiment. During his speech at the opening of the first Uganda Legislative Council as president in March 1921, he talked of how other countries as far as central Europe, India, and Rhodesia (Zimbabwe) were interested in learning from the Uganda experiment. One of the main attractions of the railway was how it was laid along the edge of the existing roads, for it to serve the public better by going through existing towns and villages. Some sections of the public were disappointment when government decided to reroute the Bombo railway along the Kitante valley from South Street because some sections of the drainage on Bombo road were badly affected during the rainy season. Another reason was that it was better for the railway not to run through the centre of Kampala in order to avoid traffic distraction and the necessity to maintain level crossings. Upon completion of the construction of the track, two tractors were imported in mid-1922, however, in a joint report by the directors of public works and that of transport -- G.N. 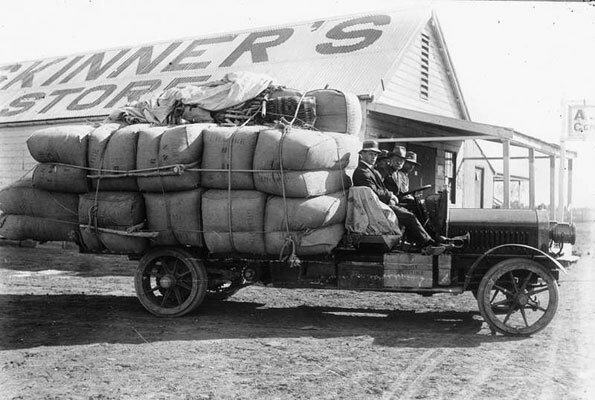 In February 1923, the Uganda Chamber of Commerce complained of the slow rate at which progress in the opening of the track was taking ahead of the year’s cotton harvest season. However, on April 1, 1923, commercial operation of the track commenced, transporting 3,700 tons of cotton by the end of the season, generating £1,812 against an expenditure of £2,341. “Wait and see or weight and sink,” it concluded in a sarcastic way. The new tractors faced a lot of difficulty in operating as they were run using wood fuel, but after intervention from the foreman from the Busoga Railway (another private company running a railway line there), they started performing to expectations. The railway’s challenge was the 1924 season when it had more than 100 tonnes of cotton to transport from Bombo to Kampala daily but could only manage 15 tonnes per trip, making only 46 trips in the entire cotton peak season between March and May. With that poor performance, the Chamber of Commerce and the Ginner’s Association complained in June 1924, leading to the creation of a commission of inquiry headed by Maj Rhodes, the chief engineer of the Uganda railway. The commission was to find the causes of the failures of the roadway system. Rhodes’s commission concluded that the tractors would have been more efficient using coal than wood or paraffin, and that there was need for improvement in the maintenance. He also suggested that the system should be kept in service than closing it down. In 1925, the Uganda railway recorded its highest transport tonnage, but the following year it nosedived to its lowest. The fall was due to handling procedures at Kampala station, forcing ginners to resort to sending their cotton direct to Port Bell by motor vans than the railway. In November 1926, it was realised that the railway was a bad proposition and that it was not a profitable venture. During the December Legislative Council meeting, the acting governor reported to the council that the traffic on the railway was disappointing mainly because of competition from the native-owned lorries and announced that the system was to be closed on December 31, 1926. Sheds big enough to accommodate a train were built at Kampala, Bombo and Gayaza, each measuring 116ft by 25ft. The tracks passed through the shed at one side leaving a working platform for offloading. At Kawempe and Mulago stations there was a provision for a turnaround. The place where this nurse training school once stood is the present day Nalinya Lwantale School in Ndejje.